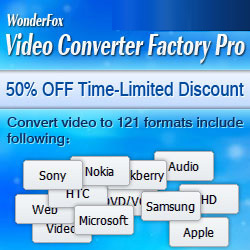 Sep 12, 2013 – WonderFox Soft Inc., a professional developer specialized in multimedia software based on Windows announces the release of WonderFox DVD Video Converter 4.6.1. We newly added the latest devices iPhone 5S and iPhone 5C to output profile in this upgraded version. So users of any iDevice can feel free to convert DVD movies and video clips you have for playback on your eye-catchy Retina display. Apple unveiled the new update to its most popular smartphone on Sep 10, 2013, announcing the release of iPhone 5S and iPhone 5C. Since the release of these two new iDevices, the team of WonderFox Soft have been working hard on the latest technology of video playback on iPhone 5S and iPhone 5C. Therefore two days later, the update version of WonderFox DVD Video Converter is finally here. This new version provides Apple users with the output profile for iPhone 5S and iPhone 5C, which enables user to convert DVD/video to high quality video optimized for iPhone 5S, iPhone 5C and enjoy more on the go with 4-inch Retina display screen. To keep pace with the latest development of video playback on smartphones is what we promise. -Add iPhone 5S and iPhone 5C to output profile. -Support importing all popular audios to program. -Newly added "Facebook" and "Twitter" button to the main interface. -Fine-tuned program to better user experience. WonderFox DVD Video Converter is the powerful software integrated with DVD ripper, video converter and online video downloader. It is your best solution to effortlessly convert almost all videos/home DVDs to a wide range of formats with 50X faster conversion and lossless quality. Click to learn more about this DVD Video Converter. WonderFox Soft, Inc. (www.videoconverterfactory.com) established in 2009, is a software company specialized in multimedia software solutions including video/audio converting and editing programs. As a professional provider for multimedia software applications, WonderFox Soft firmly holds the aim to be the best digital media software supplier. We provide comprehensive video conversion solutions, includes HD video, SD video, YouTube Video, DVD, Flash, iPad, iPod, iPhone, PSP, PS3, Zune, XBox, BlackBerry, Palm, Android, Windows Mobile, Nokia, etc.